We're back again with Bella Blvd. this week! 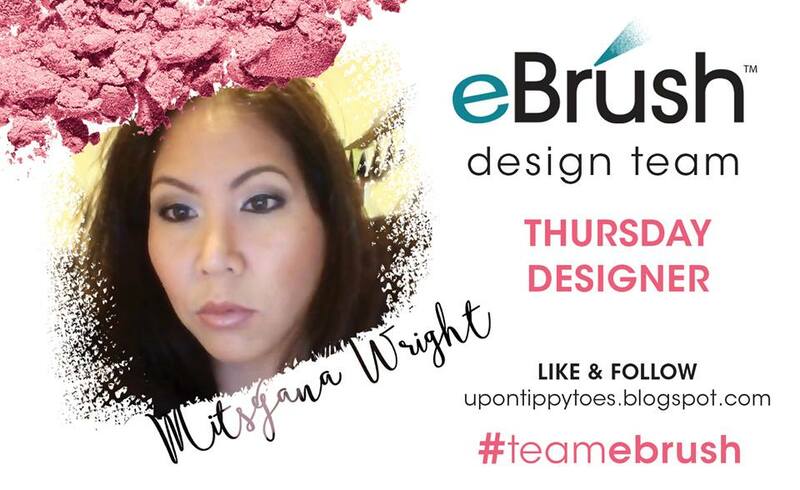 And for all you Ebrush enthusiasts that love adding bursts of color to your work Bella Blvd. 's Just Add Color line is made especially for you!! I can't tell you how much I love love love these papers from Bella Blvd.! The Just add color line is mostly composed of awesome patterns in black and white and gray scales so that all you have to do is add your own colors to coordinate with your themes or color schemes. I started by ebrushing my Bella Blvd. Star Struck paper with my Sharpie markers. The front side of this paper is covered in stars but the backside is covered in these flower doodles! I just filled in each flower doodle by either ebrushing a light pink then a dark pink for the centers or a lavender then a purple for the center. I also ebrushed the entire background in gray. After I was done ebrushing my paper I cut my piece down to 5.25"x 4" panel. 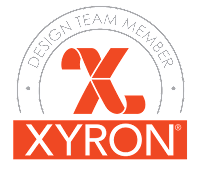 I used my Xyron Mega Runner to adhere my panel onto a standard A2 (5.5" x 4.25") card base. 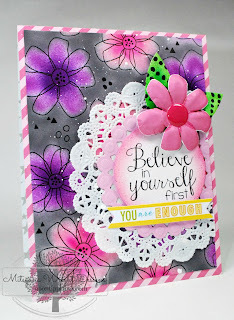 I made my card base using Bella Blvd. 's Peep Strandz paper... Love that pink on pink stripes!! 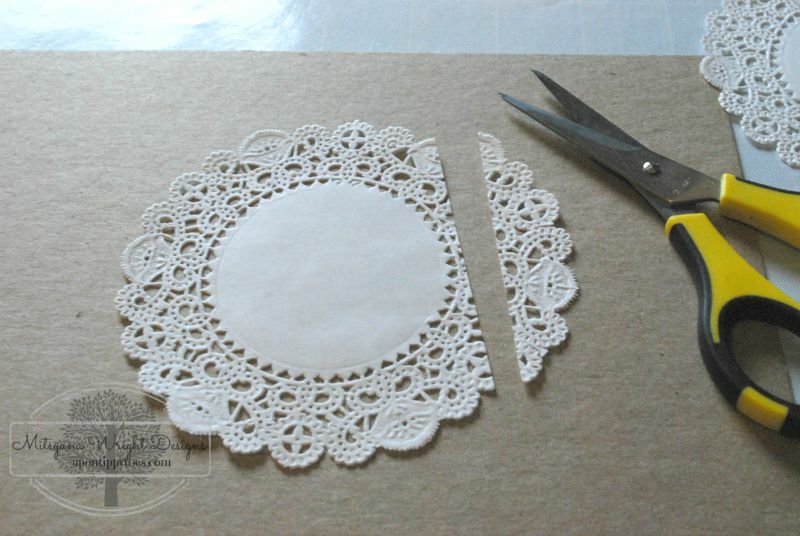 I used my scissors and cut about 1/2" off of one side my doily. To get a nice straight line I just used the edge of my card as a guide. I also used my scissor to cut out this flower from the Daily Details sheet... this flower coordinates perfectly with the flowers on the Star Struck sheet. 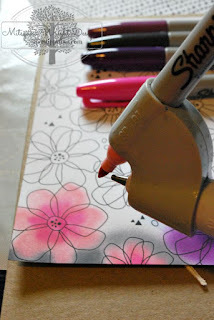 I also used m embossing stylus to round out my flower petals to add a bit of dimension. I added an enamel dot from the Bella Blvd. 's Dot Punch to complete my flower. 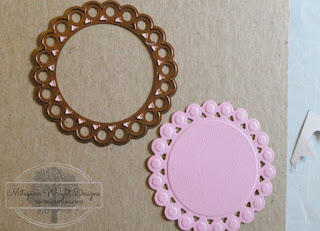 I cut a mat for my doily using the second largest beaded circle die and pink cardstock. 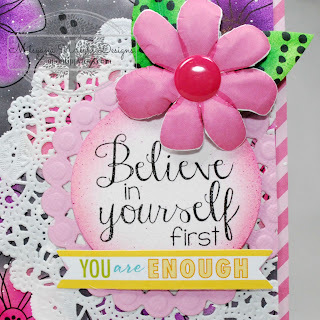 I then stamped it with this wonderful sentiment from Pink and Main's Believe Script set. This stamp set is just one of several stamps released today for the month of September!! 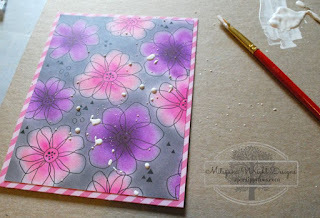 With a paintbrush I splattered some gesso onto my card base. 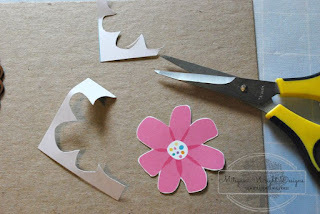 While the gesso was drying I hand cut a couple leaves out of Bell Blvd. 's Newsflash paper. 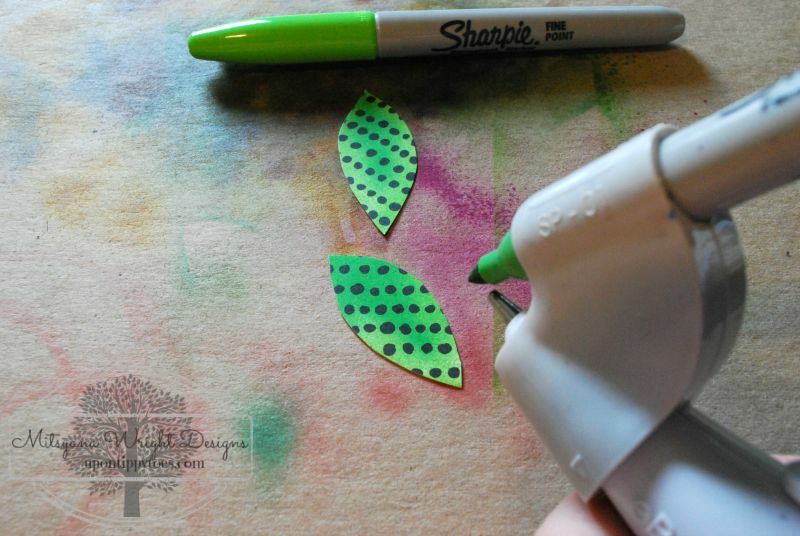 Then I ebrushed my leaves with a light green and green Sharpie. Once my gesso was dry I used my Xyron Mega Runner to adhere my doily and circle to my card base. I used 3Dots for the leaves and flower. And, the little banner that says "YOU are ENOUGH" is from Bella Blvd. 's Trinkets sticker sheet... I just peeled and stuck it onto my card... Super AWESOME!! Again... 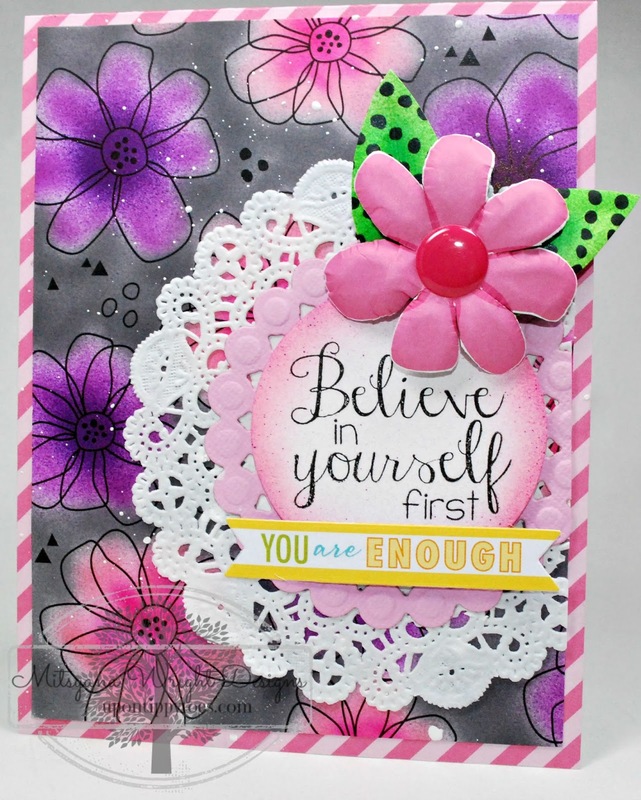 I can't say how much I love these Just Add Color papers from Bella Blvd.!! 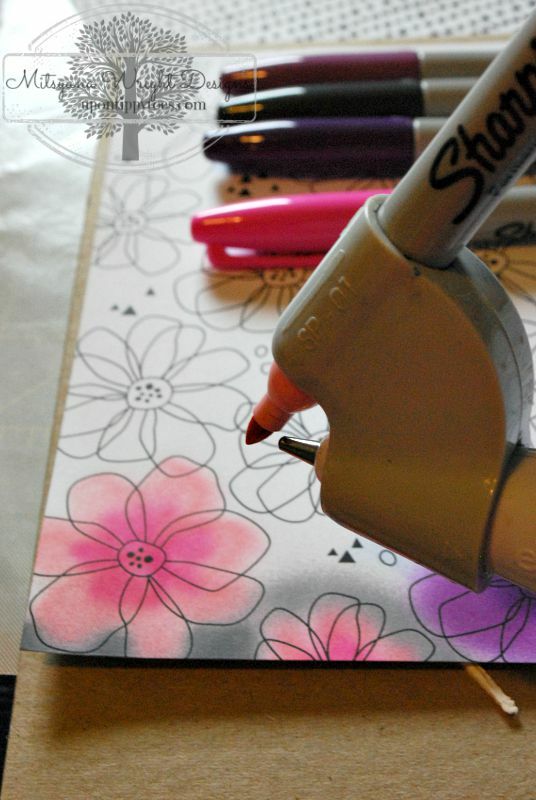 I can make each project different using the same sheet of paper jut by custom coloring it!! It makes each project unique! I want to send a very special THANK YOU to Bella Blvd. 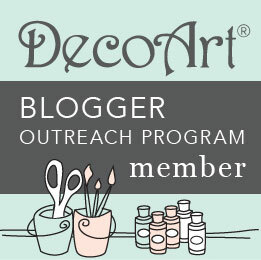 for being our wonderful sponsor!! I totally love your fun and refreshing [products!